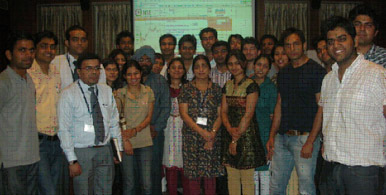 3 Apr : Students of University Business School (UBS), Panjab University Regional Centre, Ludhiana visited National Stock Exchange (NSE), New Delhi as part of their educational trip on 31st Match 2010. NSE senior executive officers conducted a three hours training module wherein MBA students were given practical training on NEAT NOW software and the functioning of the premier stock exchange of the country. The officials of NSE imparted knowledge on the securities trading concepts, NSE future plans, product development and additions, operational improvements and various career opportunities and certification courses offered by NSE.